Eve Pearl’s Magic Salmon Concealer. I first learned of salmon concealer when sitting in a workshop at the International Beauty Show years ago, before getting into freelance makeup full time. As the esthetician of my family’s spa, I was in gear to pick up some extra makeup education during my trip to the show. I sat in on an incredibly in depth and inspiring makeup class and it wasn’t until after I became a fan of the presenter that I realized she was 5 time Emmy Award winning makeup artist Eve Pearl herself. I would go to see her present every year and was amazed at all the new tricks I would learn each time I went. I also became very impressed with this special Salmon Concealer she talked about during the demo that just seemed to whisk away darkness under the eyes. Every year I would vow to buy the salmon concealer by the end of the show day and every single year I would get back to her table to find the concealer was GONE. Snatched up. Sold out before I was able to get my own hands on some! Gone are the days of running after what I was starting to believe was a mythical product. I started working for CNN a couple of years ago and was ecstatic to see that they used Eve Pearl concealer on all their guests and talent! Every man and woman who came in to get made up for TV would have Salmon Concealer under their eyes as one of the first steps of the makeup process. In fact, we went through tons of this product on a regular basis as you may be able to see from the photo I took of our low stock. It was no wonder I soon picked up the phone and called Eve’s studios right away to order my own concealer wheel for my own kit. We always have backup stock at CNN! There are four reasons that I flock to the Magic Salmon Concealer before any other which is what I like to call the “Four C’s”. Color, Consistency, Compact, and CosmeNutrientsTM! The Salmon Concealer boasts a peachy/orange hue in various shades from light to dark and now includes a new deep color which can be purchased separately or in another wheel which I will explain soon. The reason behind the color is a simple one, yet for some reason is not as widely adapted by many other cosmetic lines. That reason is one of basic color theory. Does anyone remember the color wheel in art class that looked (kind of) like this? Basic color theory states that if you mix equal parts of two complimentary colors (colors opposite each other on the color wheel) that the result will be a neutral color. Take a look at the orangey red side on the above wheel. If you go down to the tint (where white is added) you will notice colors that are close to what you find in Eve Pearl’s Salmon Concealer wheel. If you go directly opposite of those colors you will see what is reminiscent of the blue-purples that can show up under our eyes naturally. When the concealer is added to the under eye darkness it starts to neutralize and blend right into the natural skin tone of the rest of the face. Growing up I was always told to use a yellow based concealer under the eyes or one that matched the skin color exactly. Problem is, unless you have truly purple shadows under your eyes, that yellow will just make give your blue/purple shadows more of a green hue. The trick with Eve’s concealers is to pick a concealer that matches the intensity of your undereye darkness, not your skin. If you have pale skin and medium to dark undereye circles I would try the medium concealer. If you have medium to dark skin with deep under eye circles I would go with the dark shade. The majority of the women I work on fall into the light to medium shade. If you are a makeup artist of course you just get the wheel that has all the shades to be used alone or mixed to get the perfect shade. This concealer is very creamy but has holding power. I don’t know how to explain it better that Twitter friend @Tracey_MUA did after recommending it to her: “It went on so creamy, like buttah!!”. Haha! My sentiments exactly. I can use this very sparingly or I can put it on heavier and either way it will warm up and blend right down into the skin without unwanted cakey or thick texture showing on the surface. Sometimes I buff it in with a fluffy synthetic brush, sometimes I will just press it in with a finger, sometimes I will use a traditional flat concealer brush to apply it. No matter how I do it, it looks great! It’s consistency stays, well, consistent! Not only do I use this word to describe the convenience of having three of the most used shades in once slim case like the ones pictured above but I use the word to describe the options of the actual compacts themselves. There are some serious options for everyone from the at home user looking for their one perfect color to a serious pro artist needing a color for everyone they will ever work on. 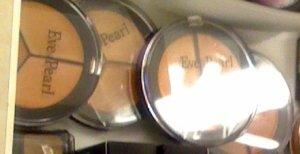 Eve’s concealers come in 1,2, or 3 shades to a compact in different shade combinations. I personally carry two of her wheel compacts with me to every job (aside from my other Eve Pearl products). I have the Magic Salmon Concealer Wheel with the three colors Light, Medium, and Dark but I also carry her HD Foundation Cream Blush Trio that includes a deep orange color that is absolutely beautiful used as a concealer for dark pigmentation and undereye shadows on deep skin tones. Between these two compacts I can easily mix and match to cover every range of undereye darkness that I come across. Oh, and I have beautiful cream blush on hand to compliment any skin tone. Score! * CosmeNutrientsTM: Cosmetics infused with nutrients. Combining the unique blends of vitamins, minerals, proteins, peptides and anti-oxidants into multi-functional cosmetic formulations. This luxurious makeup line provides a light, non-greasy yet smooth application, allowing skin to breath. The nutrients nourish, help protect, restore and renew the skin’s texture and elasticity. It also reduces the appearance of pores, fine lines and wrinkles. You can also find more benefits of the Eve Pearl active ingredients here. Now I do realize that this is a lot of info on what seems like it would be one little product rave, but I don’t love a product just to love it. I love it because it is worth it and has more to it than meets the eye. For this reason, Eve Pearl’s Salmon Concealer: You are a “Kat’s Kit” Spotlight Product!